Winter can take a heavy toll on a home. Cold temperatures and inclement weather can leave your home and lawn in rough shape, and nowhere is that more evident than in the siding and gutters. Greenish brownish stains and moldy looking grime covering the outside of a home is a tell-tale sign of the lasting effect of seasonal weather. Luckily, there's no better way to eliminate this eyesore than through power washing. Here are a few of the reasons why a power washing can benefit your home, especially on the heels of the colder winter months. One of the biggest reasons people turn to power washing is because no one enjoys looking at unsightly muck on their home. Homeowners spend a great deal of time and money on their lawn, gardens, and home interiors; the exterior of a home, however, is the most susceptible to visual wear and tear. All the landscaping in the world won’t make a dirty home look any less dingy. 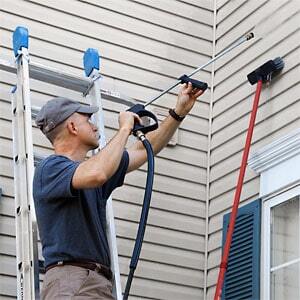 By investing in a quick power wash, it’s easy to make a home’s exterior match the time and effort put in elsewhere. It’s not just about appearances; grimy build up is a breeding ground for mold and bacteria once the weather begins to warm. This can not only lead to health concerns for anyone living in the house, but also damage the siding and gutters of your home. Power washing prevents these spots of bacteria build up and prevents problems with your home’s exterior before they can arise..
A home’s exterior is the first impression people get and has a direct correlation to the value of your home. It's very difficult to build interest in your home when potential buyers are unsettled by a grimy exterior. The longer that the exterior of a home has been neglected, the more difficult it will be to restore it to a pristine appearance. Preventative maintenance to keep the outside looking fresh can eliminate headaches down the road when the time comes to put the home on the market. Pollen season is just about to begin and the yellow-green of pollen is about to get on everything. If your house is holding on to the muck of winter, pollen can stick more easily to your home and stain both wood and brick. Freshly power washed surfaces can make it much more difficult for pollen and other potential allergens to stick to the home. Cleaning the siding and gutters is important, but there are other areas of the house which can benefit from a good power washing. Stone walkways and driveways accumulate dirt, and while it may not be something you would regularly notice, it is amazing just how much better these surfaces look after a good power washing. Decks can also greatly benefit from power washing. Wood is especially susceptible to damaging weather, bacteria, and mold, and getting your deck clean will not only help protect the wood from damage, but it will also bring out the natural beauty of your deck and make it look like new. A power washing can work as a preventative measure to protect your home as well as a genuine, long-lasting cleaning service. By investing in a Spring power washing, your can leave winter behind and keep your home clean and healthy for the warmer months to come. Alex Briggs is a contributing author for Porter’s Powerwashing.